Media Theory LLC is a Washington DC public relations and digital communications agency. Services include media relations, strategic communications, social media campaigns, digital marketing, issues advocacy, and web design and development. 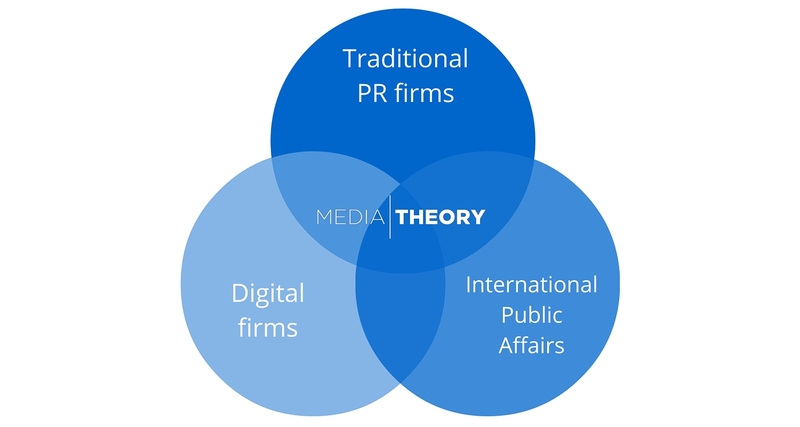 Media Theory is specialized in advising on complex international political and business issues, with experience in Africa, Asia, Europe, and Latin America. Originally doing business under K Social Media Consulting, Media Theory is a leading boutique DC public relations firm one of a new breed of public relations agencies that look beyond traditional print and broadcast media to focus on establishing a strong presence in online communities. We do things differently from many other PR and digital agencies. Our goal is to avoid overly aggressive marketing language while bringing a more transparent voice to our clients, connecting them with the relevant audiences with an emphasis on authenticity and credibility. We seek to add value to public debates, and communicate the client’s position through every available resource. Washington DC is chock full of PR, digital, and lobbying firms – and many of them are very good. But what makes our firm unique is the balance of capacity and specialization we offer. A traditional Washington DC public relations agency will focus on landing high-level print media and television appearance. Some of the leading digital marketing, web design, and web development firms deliver excellent website products … but have much less experience when it comes to actually filling them with good content and getting users to see it. As for the public affairs and international advocacy firms in town, sometimes the service offering is heavy on the Hill meetings, but light on the media results. If you are looking to appear on the Today show tomorrow to speak about a new product launch, we are probably not your firm. If however you are looking to build awareness around a crucial issue, raise profile as a thought leader in your sector, or counter a series of misleading statements attributed against your reputation, we have the right combination of PR, digital, and strategic communications advocacy to deliver powerful results. Media Theory is not a big firm, and that’s a good thing. With a focus on high-quality, personal service and committed partnerships, Media Theory services a select group of clients and causes that we believe in. Most of our referrals come from law firms and other PR agencies, however we also work independently with entrepreneurs, cause-related groups, and high-profile public figures. Our role is not just limited to online activities and coordination of press relations, but rather the contribution and innovation of ideas and strategies to help clients influence outcomes and achieve their goals. As a Washington DC PR agency, our service offering is much more than media relations, including social media consulting, cultivating engaged audiences for campaigns, website design and development, and reputation management. Learn more about the company’s founder James Kimer and the rest of the Media Theory staff here. The operations of Media Theory LLC are guided by the Code of Professional Standards for the practice of public relations as adopted by the Public Relations Society of America (PRSA).